Sea Sprouts is for boys and girls aged between 10 and 16. Cost is $50 per day. Come join Captain Nigel and his First Mate, VJ for some good old fashioned boating husbandry. A responsive and fast play style sea kayak with enough storage for overnighters and weekend trips. Designed for the smaller paddler. Taking orders now for June/July delivery. The Xcite is designed as a fast yet maneuverable coastal touring kayak. At home playing in rough water, equally comfortable carving turns through rock gardens, the Xcite has ample storage for week long trips. Its high stability and quick turning response make this boat a joy for those paddlers looking to improve their skills and take on advanced conditions. This kayak should fit paddlers 5’ 4” to 6’ 2”, capable of week long expeditioning, be stable and responsive in rough conditions, set new performance levels for playing on the sea. 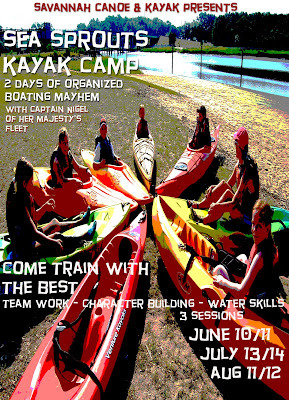 Call to reserve a time slot to try out these boats. Xcite, Xcite S and Xplore S are available to paddle. Last month Roy's house burnt down so it was amazing that this contest was happening at all. The wave ski crowd are a cool bunch of dedicated dudes from all over Florida mostly, many are stand up surfers. This year the event was opened up to kayaks so I thought I'd give it a shot and signed up for the 'Open'. Four foot it was, but glassy it was not. A steady on shore wind was blowing early in the morning and continued to do so through-out the day. The swell period was short, maybe 4 secs. So, it was a six hour drive to surf a Tybee style break. My first few heats I thought, started quite well, but I consistently scored low. 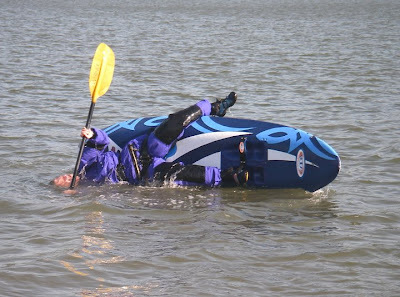 My tactics were somewhat off for the Waveski crew. I'm used to dropping late, ripping fast, throwing a turn and getting off before everything goes white. But 'length of ride' was scoring high so I had to figure this into my new strategy. The conditions continued to build, which also aided this new change of tactic. Anyway, to cut a long story short I continued to progress in heat after heat, made the final and came third overall in the Open section. We had a great time and surfed our butts raw, but Georgia beckoned and we were back across the boarder before midnight. Photos and video coming soon. Green Source USA, LLC, a Savannah based company, is launching 5 new websites dedicated to green living. Additional sites in Nashville, TN, Charlotte, N.C., Columbia, S.C., the Hudson Valley, Coastal S.C. and GA are slated to be up by the end of 2009. Co-founder Libby Bacon states, "We hope to not only be a resource for the green consumer, but also become a resource for local businesses in these areas that want to implement more sustainable practices in the workplace." Libby feels extremely fortunate to have partnered with internet marketing company Radius Media Group, which specializes in niche marketing. Research shows that Green Consumers are hard to identify by demographics such as age, ethnicity, and gender, but instead are identified by the values that they bring to the marketplace. These consumers have a desire to purchase products, goods, and services from local businesses with similar values. According to Larry and Libby, "Our desire is to help bring the local green community together by providing a local resource for low impact living." 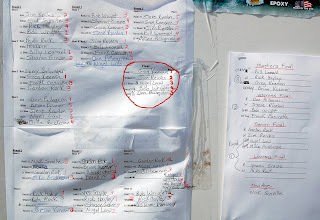 Cocoa Beach Waveski Comp - This Weekend. Open to surf kayaks this year! this Saturday, April 25 - 26 2009. Contest site is Cocoa Beach, Florida. All levels of surfers are welcome to attend. Come on down and have a great time! Some of the Savannah Beach Surf Team are heading down to the event, so we will get a full report on Monday! Here's a picture of Kristin nailing her chicken leg roll! 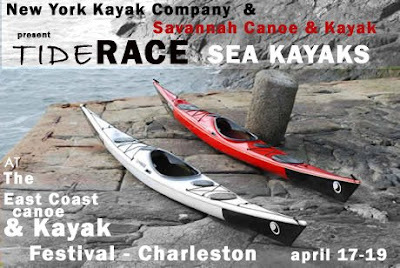 For more info contact Roy at..
Tiderace kayaks make Southeast debut. This was our ninth visit to the East Coast Kayak Festival but this year we shared a booth with Randall Henriksen of the New York Kayak Company. Randall is responsible for introducing Tiderace Kayaks to the United States and has asked us to be the Southeast dealer and demo center. We were more than pleased to handle such a great lineup of surfing sea kayaks that highly compliment our line of surf kayaks. 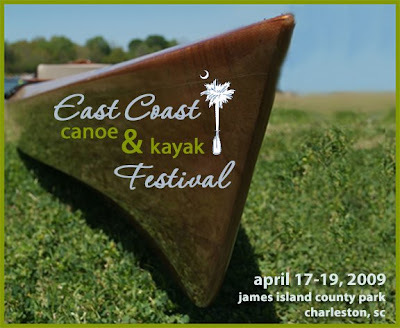 Back in February we planned to showcase the boats at Charleston were we would be able to receive feedback from top coaches and the local paddling community alike. And by all accounts the Tiderace boats were the hottest thing at the show. There are currently four boats in the Tiderace range, all of which are from the same genes (the Xcite) but all have thier own character. There are no 'LV's' here. Comfortable, quick, highly maneuverable, well put together and aesthetically hot were comments we heard time and again form top coaches such as Dale Williams, Karen Knight, Brian Smith, Jean Totz and Danny Mongo. 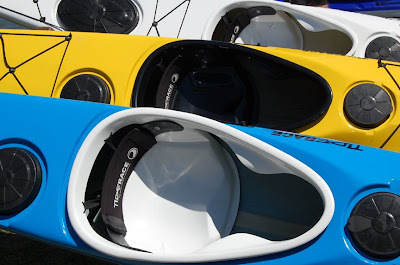 Other local paddlers compared the Tiderace Excite to a Greenlander Pro crossed with and Anas Acuta and mated with an Explorer. Of course, this was only on the pond and the boats are designed as surf and tidal race play boats. The real test will come on the ocean where extensive sea trails will soon be taking place off Tybee Island. Other things at the show of note were the new Nigel Foster Whiskey boat, a very maneuverable surf style sea kayak that looks like a lot of fun in the waves. P&H have finally cracked it with a small persons sea kayak...the Cetus Lv, a very maneuverable and fast touring boat. The weather was great, as was it to see all the familiar faces, to hang out and shoot the doodoo. Thanks to all the Savannah crew who stopped by.We'll see you at the beach. Tiderace Excite, Excite S and Explore S are now availble to demo at SC&K and we are now taking orders for June/July delivery. Full prices and details will be added to the website in the next few days. A great little adventure to a spectacular little island. Come see the hottest new sea kayaks in the last 25 years. Or just stop by for a chat and a cuppa. Xcite - Xcite S - Explore - Explore S - will all be available to demo. -Free live entertainment and performances-- all using solar-powered amplification systems. 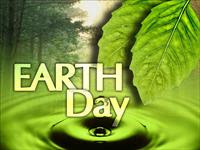 The Festival will come to a close with the Earth Day Savannah Wheelie Community Bike Ride. This evenly-paced ride, open to all bicyclists, leaves from Forsyth Park at 3 p.m. and winds its way through downtown to end at Blowin' Smoke BBQ on Martin Luther King Jr. Blvd. Sounds like a hoot ! For more green initiatives in Savannah check out Libby Bacon's Green Savannah site. Along with the very hot MEGA line, SC&K will be showcasing the new TideRACE kayaks for which we are soon to be a dealer and demo center. We will be sharing the booth with New York Kayak Company. So stop by to see the latest and best of composite manufacturing and designs in the paddle sports world today. "He was a nice, young fellow, and he got along with everybody," his mother, Susie Davis, recalled Tuesday evening. Ling, a ninth-grader at Groves High School, was with three friends when he drifted under the cold, choppy water Monday afternoon. The group had waded toward land from a sandbar, according to a Tybee Island police report of the incident. Ling yelled as he sank. He never resurfaced. 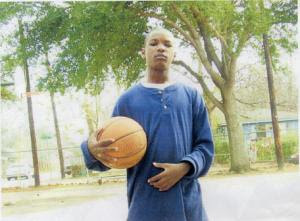 "He was a very smart child - he stayed to himself and didn't bother anyone," said Kimberly Davis, the boy's aunt. " Survivors include a brother, 10, and a sister, 12. Funeral arrangements are pending. It was Rashad's first visit to the beach. 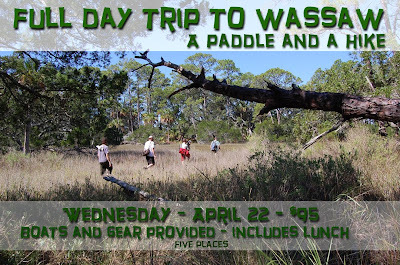 Once you have completed an Intro class this is a great way to really enjoy coastal paddling. Full day trips cover more ground and offer greater opportunities to practice skills, experiencing a wider variety of conditions and environments. Steve Braden will be leading this trip which will circumnavigate Myrtle Hammock - conditions permitting. 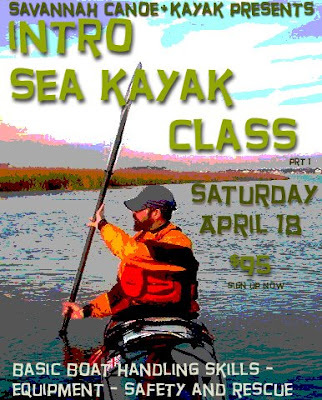 Sea Kayak Classes - Skills - Fun. Ebb Tidal Delta Claims Another Life. "The search began Monday afternoon after the boy was swept underwater while wading with friends off the southern tip of Tybee Island. The youngster was on a sandbar near Little Tybee Island with at least three other teenagers shortly before 3 p.m. when he vanished as the incoming tide rolled ashore, said Tybee Island Fire Chief Skip Sasser. " And it's often local kids that are getting into trouble in a place they should know very well to be unstable, dangerous. Yesterday, at 3pm was mid tide...maximum flood. The water is rising at nearly two feet per hour. 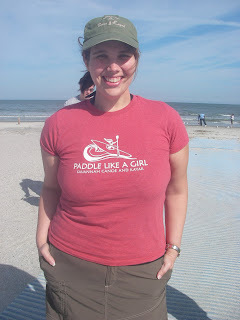 On the back deck of my kayak, on several occasions, I have assisted people 'off' the sand bars because they were unable to swim back to Tybee. In fact, about two years ago, during a private kayak lesson myself and my client shuttled a group of six teenagers between sand bars. Even the Lifeguards were unable to reach them due to the strength of the current. They were exhausted, freaked out and completely unable to swim across the strong tidal waters. They were all from Savannah and kayaks saved their lives that day. 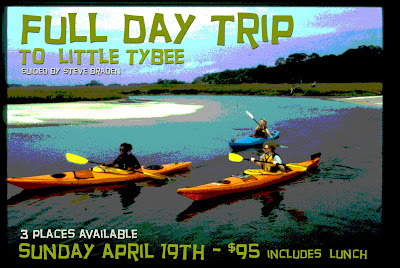 Let's face it, its a long way to Little Tybee across the delta which is basically the sea bed. At first the tide moves back in slowly and little change seems to take place. But after two hours the current speed really kicks in and the sea quickly reclaims the sand bars that literally dissolve under foot. I grew up by the seaside in a place not too dissimilar to Savannah. My father told me that if I walked around the headland at low tide I would not be able to get back and would need to be rescued or would drown. He was serious. I was made aware of tides, currents and the constant cycle and change of the coastal environment. SC&K sends condolences to the boys family at this tragic time. Hopefully other families will learn from it. or, possibly... Kayaker Saves Life. Tackle the waves on a surf specific sit-on-top.